If you're building a new deck or remodeling an old one, consider the use of vinyl deck tiles in place of wood planks. Deck tiles allow you to create patterns and customize the look of your deck, while the vinyl will help keep your deck looking great for years. If you'd like to see something other than straight lines of planks moving across your deck, consider what deck tiles can do. Deck tiles are 12-inch square tiles made of rubber, vinyl, wood or other materials, made into a wood pattern. The tiles can be installed over asphalt, concrete, wood or directly on top of an old deck. You can use deck tiles to create a low maintenance, great looking deck in no time. Choose from parquet or any number of 6 or 12 plank patterns and lay the tiles in an interlocking pattern to give your deck a more decorative appearance. Using deck tiles, you can create pinwheel patterns, a traditional parquet feel, herringbone looks, or your own personalized design. You can also install deck tiles yourself, even over an existing deck, saving you hundreds in builder fees. 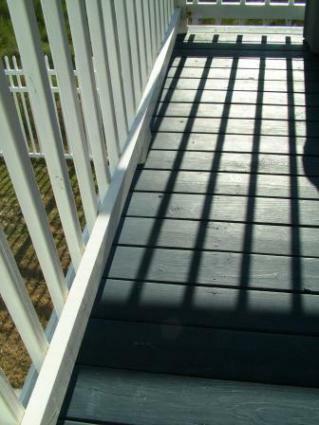 While deck tiles are available in multiple species of wood, any type of wood deck is going to require maintenance. You'll have to worry about staining, mold and mildew removal and the eventual rotting of the wood. Vinyl deck tiles eliminate these concerns. Vinyl is a virtually maintenance free choice for both interior and exterior areas of the home, making it a great choice for your deck or patio. Vinyl tiles have come a long way from the asbestos backed tiles laid in garages and basements. Today's vinyl tiles can accurately replicate the look and feel of wood, with several colors and styles to choose from. Several wood grains and stains are available, as well as colors which mimic the look of painted wood, perfect for the front porch of your home. The tiles themselves are flexible and require no maintenance beyond a garden hose once they're in place. The edges of most deck tiles are scored so that they can snap together. In essence, you're creating a floating floor outside over your deck. Once you've secured the first row of tiles, you'll simply snap the next ones right into one another into whatever pattern you choose. Since vinyl tiles for decks are low cost, easy to install and low maintenance, you may be considering them for your deck. If you're wondering what kinds of deck designs you could produce with them, consider a few of these options. Vinyl deck tiles are an extremely low cost option, starting at around $2 a square foot for more patterns and designs. Combine this upfront savings with the money you can save on builder fees, and the stains and deck washes you won't be purchasing, and your new deck may be one of the biggest home improvement returns you'll get for your home. The next time your deck needs staining, or if you're thinking about building a new deck, give vinyl tiles a look. You may find the benefits, design and personalization to be just what you're looking for.